Excellent navigation practice, enough wind to sail, warm and clear skies, varied port stops, and enough brown sauce to replace water. Boat checks and food shopping done, we set sail and dived straight in with boat handling and manoeuvre training whilst waiting to pick up our final crew member Sara. Sailing on into the night, we moved into 3hr on/off watches, which we would continue for the rest of the trip. Fun facts discovered on watch: the kraken can be placated with apples, custard doughnut is a real vaping flavour, and you can see a red glow around Mars as it rises in the sky. We arrived in Dartmouth for breakfast, eagerly anticipating the full English that Alf Fresco is known for. A few, *ahem*, unnamed crew members scurried off to buy socks, blankets and towels: fundamental items that slipped past their kit bags! Next stop was Salcombe for a cheeky afternoon ice cream before sailing onwards to Falmouth. This would be the first night of a few that Paddy drew up beautifully detailed harbour entry plans, to then promptly sleep through it (and wake up again for the bacon sandwich on arrival). Jamie excitedly stepped up and sailed the JJT into his home port, pointing out the local highlights (gesturing in their dark direction) as we sailed in on the lights at 0100. 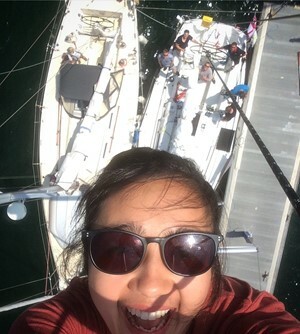 A short day was spent in Falmouth and following promises of climbing the mast, I (Lois) spent the majority of the morning eagerly wearing the harness, ready to be winched up to check the lines and attach a halyard. We set sail again to the Isles of Scilly where the crew got stuck in with a mix of kayaking, running, swimming, walking, and cycling to explore the scenic views. This was our “exotic” port stop. A fantastic time was had by all; the delivery leg provided valuable experience for the qualified skippers to progress, and the novices have gained their competent crew certificates and solid mileage to set them off on the right track. Jackaroo is an RNSA owned J80 that is dry sailed from Queen Ann's Battery in Plymouth and available for regular racing - new crew and Skippers are needed to make the most of this valuable ..
Members who wish to be aware there are berths available in the Portsmouth area Within the Portsmouth area we have moorings available, these include pontoon berths and swinging moorings, ..
A quick update for those who did not attend the AGM As our Commodore outlined in his letter we have been waiting on feedback from the Charity Commission regarding our application to ..
A friendly bottlenose dolphin has taken up residence in Portland harbour and is charming all water users. The dolphin has been playing with boats, swimming with locals and keeping .. The latest newsletter from the port. The Royal Naval Sailing Association periodically sends out email updates to its membership. In doing so, RNSA takes all reasonable precautions to ensure that the emails are only sent to those who have requested them, and that no third party can make unauthorised use of any @rnsa.org.uk email address to send out mailings. If you receive unsolicited mail from RNSA then please inform us at depgensec@rnsa.org.uk and we will take appropriate action.